Rockland County, NY - It was an emotional moment last week as a Holocaust survivor met face to face with a member of the infantry division that liberated the concentration camp where he was being interred just over 73 years ago. Williamsburg resident Lipot Rubinstein and Nanuet resident Alan Moskin, both 92 years old, met at the Holocaust Museum and Center for Tolerance and Education housed in Rockland Community College on July 26th. Rubinstein was accompanied by family members who filmed the over hour-long meeting. Rubinstein and Moskin shared an embrace when they were first introduced, with both recalling the exact date that the Gunskirchen camp in Austria, a sub-camp of Mauthausen, was liberated, Friday, May 4th 1945. The pair also recalled that it was a gloomy rainy day, with the stench of death hanging in the air. Moskin was 18 years old and a member of the 71st Infantry Division under the command of General George Patton at the time of the liberation. “There were skeletons, bodies all over and those who were survived were emaciated beyond description,” Moskin told VIN News. “There were people pleading for essen, for vasser. We had been told that Hitler didn’t like Jews but we weren’t prepared for what we saw. Recounting their thoughts on the liberation took both men back in time, noted grandson Shimmy Rubinstein. 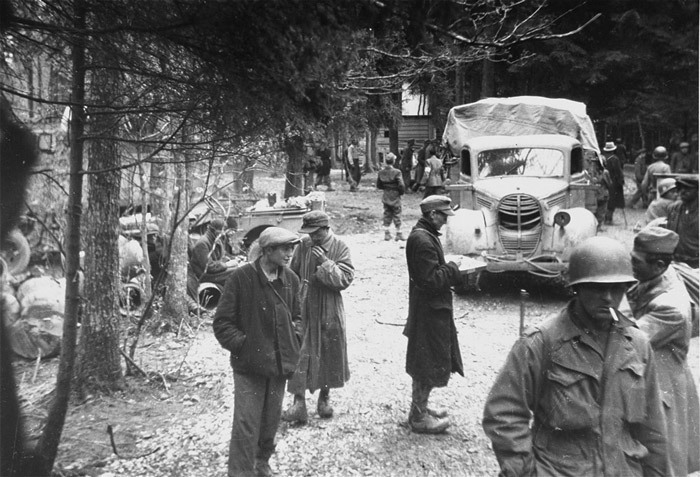 Survivors and American troops in Gunskirchen, a subcamp of the Mauthausen concentration camp, after the war. Moskin recalled how members of his division handed out whatever provisions they had to the prisoners they met, some of whom couldn’t have weighed more than 70 pounds. Lipot Rubinstein, the sole surviving member of his family, told of how after the liberation he managed to get four packages of margarine from a warehouse, devouring them in one minute. He later fell into a coma that lasted more than four weeks. 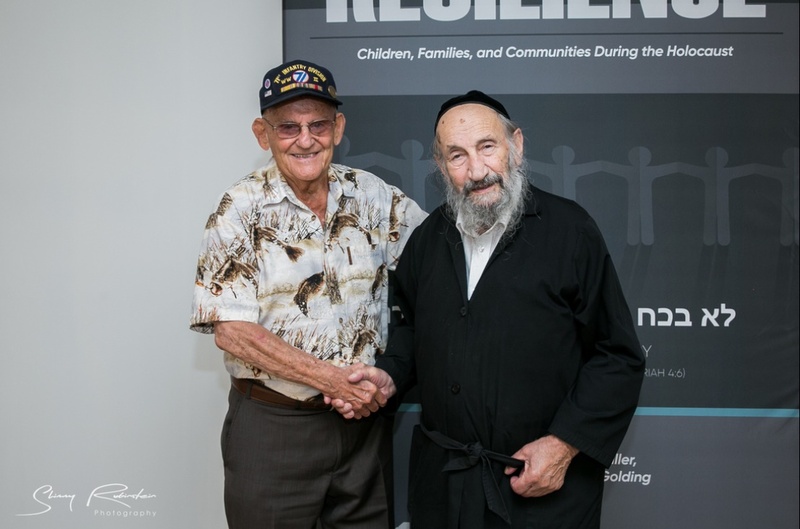 Moskin was eager to hear about what happened to Rubinstein after liberation, learning that the Hungarian survivor walked out of the camp with a cousin who collapsed on the roadway. Both were ultimately picked up my trucks of soldiers who drove around collecting survivors and transporting them to safety. Returning to his hometown, Rubinstein managed to dig up his family’s hidden treasures that had been buried in the ground: a candelabra and a menorah were still intact, while a bathtub filled with clothing bought for a sister who was engaged to be married did not. Rubinstein also shared how he had risked his life to get lifesaving medicine for someone he knew from his hometown, a man who repaid the favor years later by introducing him to his niece, who ultimately became Rubinstein’s wife. For Rubinstein it was his first time meeting a soldier who liberated Gunskirchen, while Moskin said that over the past few years he has met eight people who were interred in the camp. Moskin has lectured to more than 70,000 middle school and high school students in 12 states about the horrors he saw during World War II. A former attorney, Moskin said that he was plagued by nightmares for years and has only recently begun sharing his experiences, something he has found surprisingly cathartic. Speaking out about the war has also led to meetings with former Gunskirchen prisoners. Moskin plans to continuing lecturing about the Holocaust, teaching the next generation an often neglected page of world history. 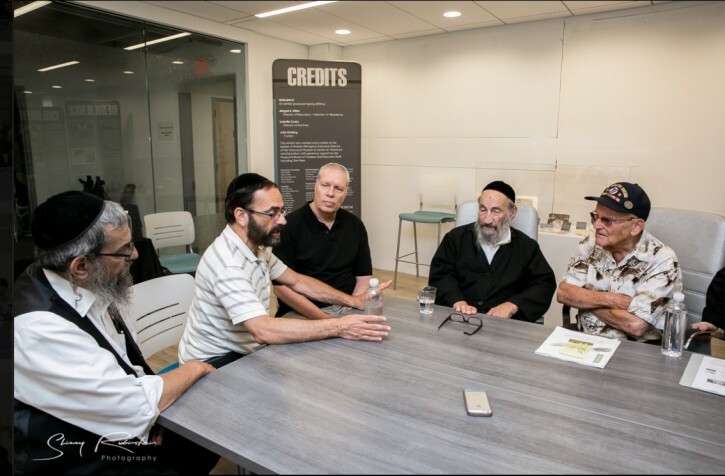 Having the opportunity to meet Gunskirchen’s survivors has been extremely meaningful to Moskin. Those sentiments were echoed by Shimmy Rubinstein. “To shake hands with one of the people who liberated my grandfather was fascinating,” said Rubinstein. they don't teach about WWII or the Holocaust in schools because that is white mans issue, they teach about "heroes" like terrorist Mandela, the philanderer MLK and the racist Macolm X, or the day laborer Cesar Chavez. This was a wonderful story. I'm glad it happened in Rockland County. I just think it should have been the two men and their families and the politician should have stayed home. Whatta story!! Btw, its nice for a change to see a holocaust survivor looking like a jew and an erlicha yid. “ they don't teach about WWII or the Holocaust in schools"
Sadly, its not taught in any litvish or chasidishe yeshivas either. The litvish yeshivas consider it bitul tayrehh, while satmar teaches only hatred of the medina. over 100 decendants - kein yirbu! I guess you've never been to Israel. Or Boro Park. Or Williamsburg. Or. Or. Huh? Wonder where you’ve been hiding out. Walk into any local bais midrash in Rockland County or the 5 boroughs and beyond and you’ll find yourself having the honor and privilege of meeting countless of frum and erliche survivors! “ “ they don't teach about WWII or the Holocaust in schools"
Teaching the holocaust to our young children is very controversial. Y r we teaching it? Cuz G D was (ch”v) mean to His people? NO! If u wanna teach them a moral which is rarely the case, then teaching it is understood and important. Btw, the (little) education the Satmar kids are receiving to HATE the Medina is far from enough. They are still quite illiterate as to how far the treifene medinah spites H every minute of its existence. THIS shld be taught more to our kids cuz thats EMUNAH. Teaching the holocaust only brings questions into kids minds. It shld be explained the right way so our kids dont have questions to Hashem. They shld teach them way more hatred. Its the essence of Klal Yisroel that the Zionists wanna eradicate. Teaching bout the holocaust is a different issue. U can do that more but unfortunately the treifene Medina is the calamity of our dor. Our children shld be taught the danger of Zionism as per the great Rebbe of “Belz”. The holy Belzer Rebbe, Reb Yisochor Dov had harsher words on the Zionists than the Satmar Rav had if u read history but u dont cuz its not convenient. My cousin of blessed memory, who would have been ninety eight years old, was also one of the liberators, as he served under General George Patton. For those revisionists, who still claim that Jews never served in the armed forces of the USA, during World War Two, those American Jewish soldiers who fought the Nazis, will always be fondly remembered. My cousin told me that in addition to being in firefights with Nazi troops in Europe, he still occasionally encountered anti-semitism from fellow GI's. He punched a fellow GI who was making anti-semitic remarks. The soldier whom he punched wanted to know why my cousin did it. When my cousin proudly stated that he was a Jew, the anti-semite had the nerve to tell my cousin "I didn't know that you were Jewish". In other words, according to that anti-semite, if my cousin wasn't Jewish, it would have been ok to say what he did. He also told me that after they were in a firefight with some Nazis, they took the commandant prisoner (who was a hardened Nazi), and shot him dead on the spot. I notice that Belz has no qualms about taking money from the hated Medina. You know, the more I hear the squealing of Satmar and numbers 8 and 9, the more I'm convinced that Medinas Israel is truly reishis zmichas geulaseinu and the afore mentioned chazeirim represent ikvesa d'meshicha. The Belz sect is as illiterate about what their holy Rebbe’s stance on Zionism was nor are they intrsted in knowing. Its not convenient for them. I have met many holocaust survivors and several army personal who were there and read much about the holocaust. It is still difficult to digest and understand how Hitler was able to do so much hatred but I also read Avidor Miller's book, Divine Madness, which helped me put it together. I recommend all yeshiva and seminary people to get a copy and read it. R. Miller was there before the war and saw what caused it. UNBELIEVABLE !! My father z"l also served in the US army. infantry. He was sickened when he got there (the camps). He was trying to find his sister and family..was told "they cleaned away the garbage" (mass graves). He endured anti-Semitism during training in the USA as well. He beat up an officer for calling him a 'dirty Jew'. He wasn't demoted. But that lead to a real bawling-out and pep-talk from the commander to ALL the men..discrimination will not be tolerated, he said. We are all united under one flag, he said. It was better after that in boot camp. But Europe left its mark..all the soldiers felt it . The kids have to be taught. From the survivors, from the servicemen..not so much the textbooks. There isn't much time...they are getting old and dying. Todays kids don't know what fear, struggle, hunger, poverty,respect, loyalty, hard work is...compared to the past, and must be taught! !